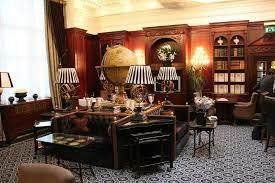 Glamorous, iconic and secretive, London’s Hotel ‘41’ shares many similarities with legendary protagonist James Bond. In tribute to the 24th James Bond film, Spectre, guests can live like their favorite secret agent with ‘41’s specially curated “Secrets and Spies” package. Discretion is the key to every spy’s success, and the best place to achieve this is behind the discreet oak door of Hotel ‘41.’ Enter into a world of five-star luxury and refinement, enjoying a “shaken, not stirred” martini on arrival before checking into a suite worthy of any spy and his leading lady. Located right on the doorstep of Buckingham Palace, Hotel ‘41’ is perfectly situated to explore the English capital. Follow in the footsteps of 007 on a James Bond London Tour, concluding with the opportunity to meet an actor or production member from the Bond film series. A private chauffeur then whisks you away to a private helicopter and the rare aerial experience of seeing the city from new heights. “Secrets and Spies” is priced from $6,115 based on two people sh.aring one room for three nights . . For details and reservations, contact Hotel ’41’ at +44 20 7300 0041, email: book41@rchmail.com, or visit online at http://www.41hotel.com.